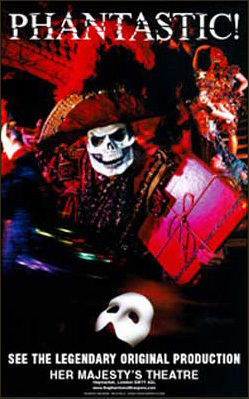 I have been looking for a "Phantom of the Opera"-poster for a very long time and I am hoping one of you could maybe help me. It is an ad for the production at Her Majesty's Theater and it is probably a few years old. I managed to get a picture of it (see below). I really love this poster. I had a copy once but it was lost, so now I am desperately looking for a new one. I really hope there is anyone here who can help me! That is a cool poster! I didn't even know there were ones like that!